Tri Force Heroes is an Event Course in Super Mario Maker, released on November 4, 2015. It is based on the Nintendo 3DS game The Legend of Zelda: Tri Force Heroes. It unlocks the Totem Link Mystery Mushroom costume upon completion. 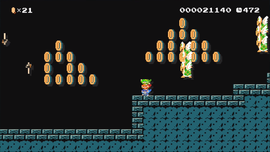 The level begins with some coins arranged to look like the Triforce, with the wisdom crest containing a Mystery Mushroom. Mario must then traverse towers of Goombas and Big Goombas, followed by a section of warp pipes. Some Koopa Troopas and Big Koopa Troopas appear afterward, followed by some Hammer Bros. Sets of Koopa Paratroopas appear, along with some Para-Beetles carrying other enemies. A tower of big Magikoopas follow, along with some Fire Bars and Brick Blocks reading "ZELDA". After three Cannons, the Goal Pole is reached. Three heads are better than one! Work together with your fellow heroes, and no puzzle or challenge will stand in your way—that's how things work in The Legend of Zelda: Tri Force Heroes! And now you can experience that world as a Mario course. Form a three-hero totem and head for the goal! Zeruda no Densetsu Toraifōsu Sanjūshi The Japanese name for The Legend of Zelda: Tri Force Heroes, "The Legend of Zelda: The Three Triforce Musketeers". This page was last edited on August 26, 2017, at 09:52.